Earlier this year, Quebec potato processing company Patates Dolbec Inc. was awarded Canadian government funding to upgrade their equipment. With access to this capital, the growing company of over 125 employees will integrate Industry 4.0 technologies into their facility. As a result of the project, robotic equipment will sort, grade, and pack more fresh potatoes in less time, driving competitiveness significantly. Patates Dolbec will access up to $4.5 million in Canadian government funding in support of their Industry 4.0 agriculture project. The company’s government funding application was successfully approved through AgriInnovation, a government business loan targeted at Canadian agriculture and agri-food companies. Although the program is now closed, it was replaced in early 2018 by the AgriInnovate Program, a five-year initiative that offsets the costs of highly-innovative technology projects with up to $10 million in repayable funding. Patates Dolbec is a Quebec-based producer and packager of high-quality potatoes. Since 1967, the company has steadily expanded from a small family-run farm business to a highly-competitive organization with over 125 employees. This growth has been supported by decades of continual investment in facilities and equipment. One of the company’s latest (and largest) investments focused on introducing Industry 4.0 technologies that connect multiple stages of their production cycle. As a result, the new robotic equipment will sort, grade, and pack potatoes more efficiently, and provide management with greater visibility into where future improvements can be made. This will continue to drive down operating costs over time and enable the company to grow export markets within the United States. With the support of Canadian business loans, Patates Dolbec will leverage up to $4.5 million and reduce the upfront capital costs of Industry 4.0 technologies. The plant modernization project will help Dolbec access new opportunities possible through Industry 4.0, a term used to discuss the next industrial revolution. It’s based on the concept of the Industrial Internet of Things (IIoT), or an interconnected factory model that gives management complete visibility of the manufacturing process. While Industry 3.0 largely focuses on the automation of single production processes, Industry 4.0 seeks to link each automated process together to limit bottlenecks and lower operating costs. Patates Dolbec will access this funding from the AgriInnovation program, a government funding initiative that closed in March 2018. The program was later re-launched in April 2018 with the new and improved AgriInnovate Program, which is very similar in nature to AgriInnovation. AgriInnovate is a five-year (2018-2023) Canadian government funding program that offers repayable funding contributions to offset project costs. Through the program, agriculture and agri-food businesses can access funding, then repay the small business loan up to 10 years after the project is complete. This offers manufacturers and food producers the opportunity to invest in technologies much sooner than would otherwise be possible. Canadian agriculture and agri-food companies may access up to 50% of project expenses to a maximum $10 million in interest-free government loans. To access funding from the program, businesses must be committed to the adoption, demonstration, or commercialization of innovative agricultural-based products, technologies, processes, or services. Applications are accepted by the program year-round. AgriInnovate is one of the many Canadian government funding programs that can support the purchase and implementation of Industry 4.0 technologies. Not only are government grants and loans available to offset the equipment costs, but additional funding also exists to hire and train employees for new manufacturing processes. 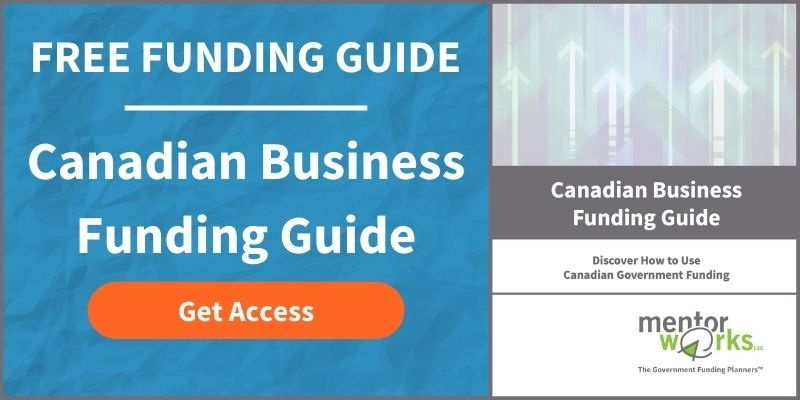 Industry 4.0 projects are highly eligible to receive government funding; learn more about types of funding and how funding is awarded by downloading the Canadian Small Business Funding Guide. Posted: June 21, 2018 by Jeff Shepherd. Updated: June 21, 2018 by Jeff Shepherd.